Dr. Rothstein has retired after 43 years as a Veterinarian. We wish him nothing but the best as he enjoys retired life! As a child, Dr. Marc Rothstein kept everything from fish and ducks to chickens and dogs as pets. He always felt a strong bond with creatures of all types, and as he got older, Dr. Rothstein found that the science behind animal care fascinated him as well. Becoming a veterinarian was the perfect career path! 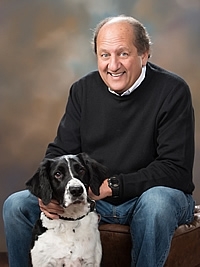 Dr. Rothstein was born in St. Paul, Minnesota, and attended the University of Minnesota’s College of Veterinary Medicine to receive his veterinary degree. He then served as a Captain in the United States Army’s Veterinary Corps during the Vietnam War. In 1975, Dr. Rothstein opened Golden Valley Animal Hospital’s first location, not far from the current site. As a vet, Dr. Rothstein particularly enjoys surgery because he likes working with his hands—seeing the results of his work after a pet is healed up is extremely satisfying for him. He also likes to perform “surgery” on computers and other things that tend to break around the office. At home, Dr. Rothstein has one pet of his own: Marley, a dog that Dr. Rothstein adopted when the previous owner could no longer keep him. Dr. Rothstein’s grandchildren are delighted when Marley does tricks in exchange for treats!